You can request a copy of your free credit report once every 12 months. What information is included on my credit report? This includes information like your name, date of birth, address history as well as your driver’s licence number and employment history. Details of credit enquiries that have been made on you when you have made an application for consumer credit. Consumer credit relates to loans for household or family purposes as well as for the purchase, renovation or re-financing of a residential investment property. Obvious types of credit include credit cards and loans like mortgages, personal and car loans as well as credit contracts such as telephone, electricity, gas and internet. Other forms of credit include interest free store finance and store cards. Consumer credit liability accounts – this is an account that you currently have open or may have had in the past. It includes the type of account, the open and/or close date as well as the credit limit. Details of credit enquiries that have been made on you for commercial credit. Examples of commercial credit include a mobile phone contract or credit card for business use or a business loan. 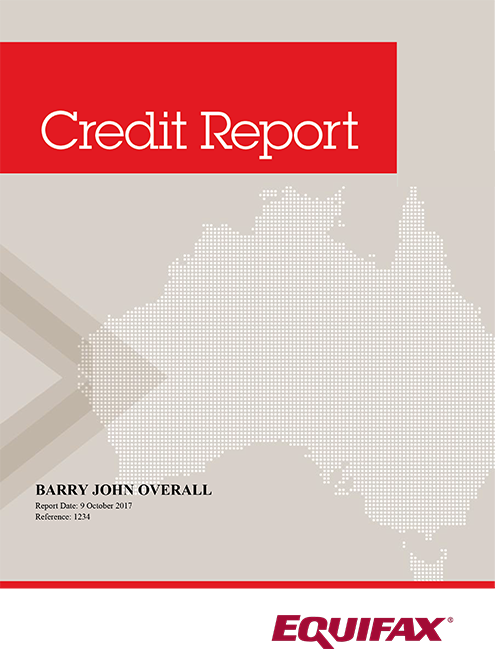 Details of any overdue commercial credit accounts and other debts. File access information is also included. This outlines who has accessed your credit report. For consumer credit reporting, only credit providers, affected information recipients, access seekers and credit reporting bodies like Equifax can access your report under the requirements of the Privacy Act. You can view a sample Equifax credit report here. *You have a right to obtain a free copy of your credit file from Equifax if your credit application was declined (your free credit file request must be made within 90 days from the date your application was declined), if you have lodged a correction request and have been advised that your file has been corrected, and once every 12 months.